This is the second introductory tutorial to BEAST. Here we will continue the analysis from the first tutorial looking at the output, diagnosing problems and summarising the results. 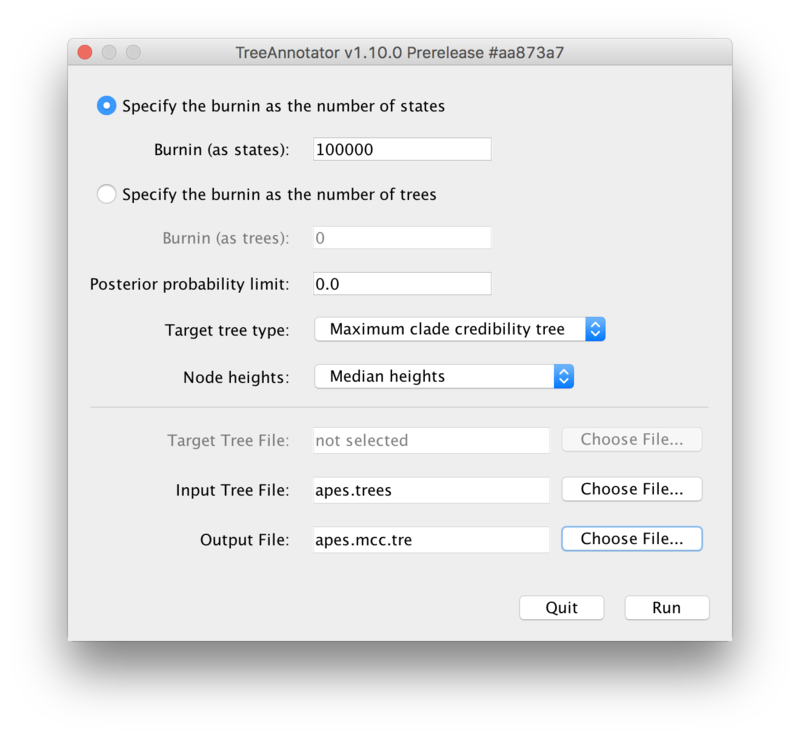 This tutorial will introduce some of the utilities packaged with BEAST, logcombiner and treeannotator, as well as the external applications, Tracer and FigTree. In the first introductory tutorial we looked at importing data into BEAUti, setting up a model and analysis, and running this analysis in BEAST. 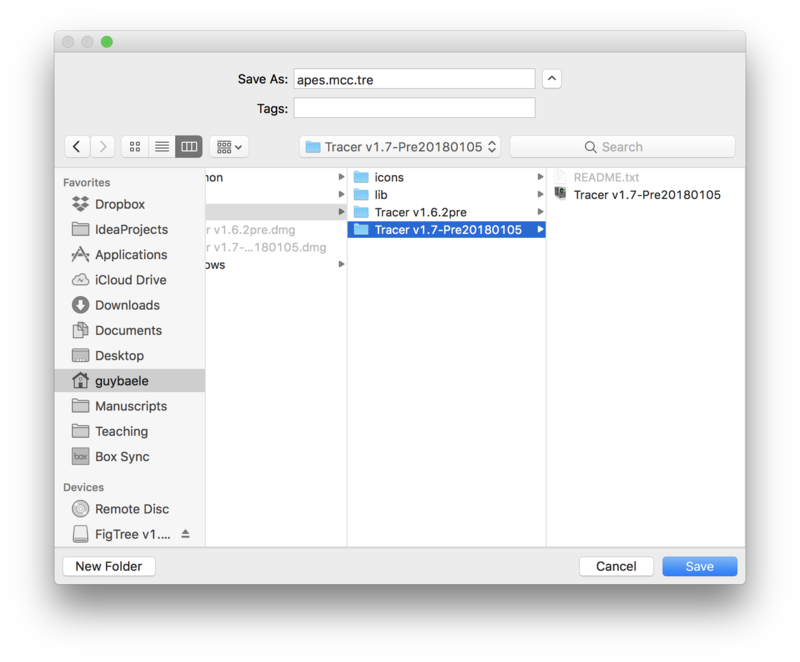 In this second tutorial, we will analyse the output of that analysis by examining its output file in Tracer and by building a consensus tree and visualising it in FigTree. But first, we explain how to combine the output files of multiple independent replicates (i.e. running the same BEAST XML using different starting seeds). Such a setup can be useful when achieving a good effective sample size for each parameter is computationally cumbersome for example, and multiple hardware resources are available to run independent replicates in parallel. LogCombiner is distributed as part of the BEAST package and allows you to combine multiple output files into a single output file, which can make for easier post-processing of your analysis. Note that to combine these output files, you’ll have to run LogCombiner twice, once to combine the .log files and once more to combine the .trees files. More information on how to use LogCombiner can be found on its dedicated page. For the remainder of this tutorial, we will assume the presence of a single .log file and a single .trees file. Typically, the acceptance ratio of a transition kernel will be around 0.234 or higher, depending on the type of operation. Note that it is known to not be the case for certain tree transition kernels, especially so here given the small number of taxa that we’re analysing. The most important thing here is to ascertain that none of the standard transition kernels have an acceptance rate of zero. 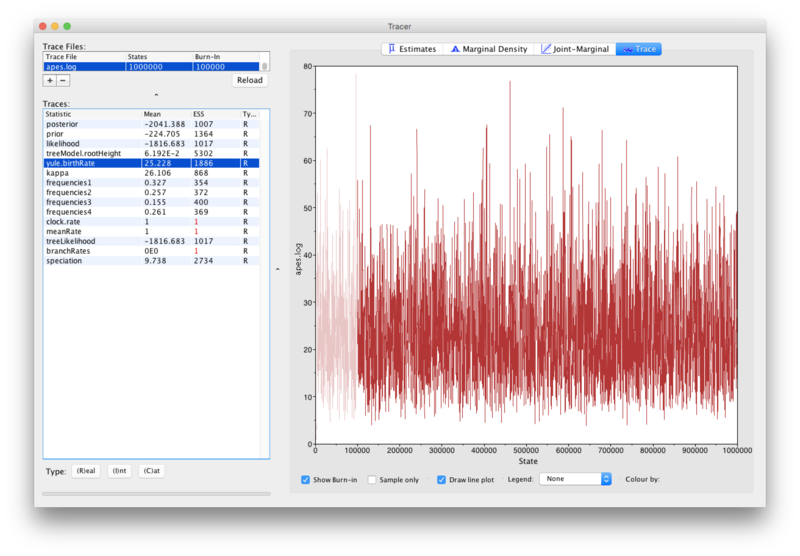 From the Tracer window, it’s clear that the ESS values for all the continuous parameters are more than sufficient to terminate the analysis. Note that ESS values should not be used/estimated for categorical or discrete parameters, and neither for the posterior, likelihood and prior density samples. However, for those latter estimates, low ESS values may reflect underlying problems in estimating certain parameters, so they do have their use for such densities. For discrete parameters, it may be of interest to inspect the traces of those parameters so that proper convergence towards the posterior distribution can be assessed. Note that constant parameters, i.e. parameters that are not being estimated (such as the clock.rate and the meanRate) or normalizing constants (such as the branchRates), are shown for completeness but need not be inspected for convergence and/or ESS values. 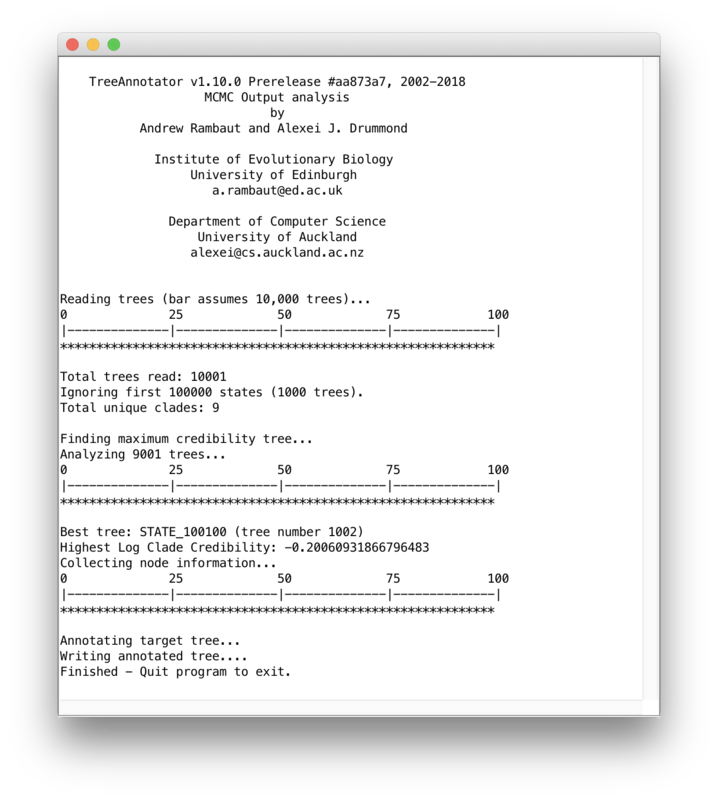 More detailed Tracer tutorials are available, focusing on analysing BEAST output and assessing convergence. It’s simply not feasible to inspect every tree that was visited during the BEAST analysis, hence we will create a consensus tree summarizing the posterior tree distribution. 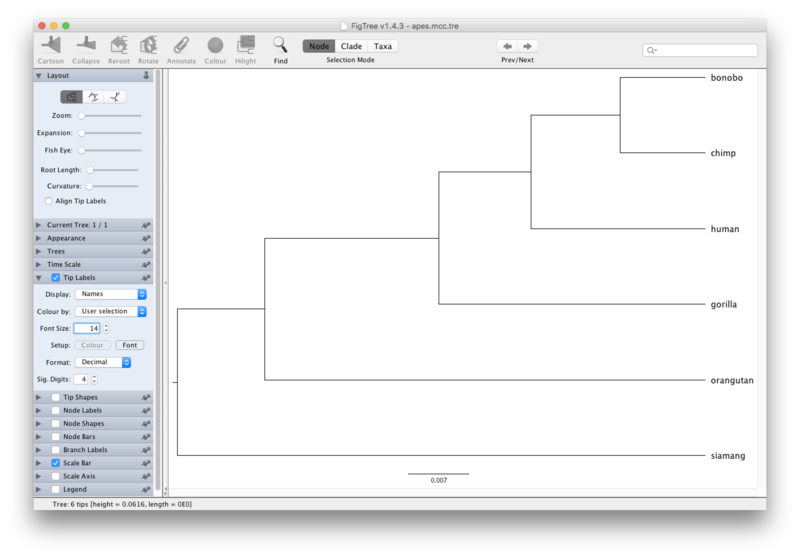 Within the BEAST package, this is done by constructing a maximum clade credibilty (MCC) tree using the program TreeAnnotator.